The city tore down businesses and put up a parking lot here, where Wasabi, Taste of China and the StarShip 9 Theater used to be. Now, they've begun tearing out the parking lot. Progress? Three years ago, the city finally found a way to get the owner of a downtown Chinese restaurant to give in and sell his property to make way for a huge high-rise project. The restaurant owner was the last holdout on half a block that once had a $2 theater and Japanese restaurant. The restaurant owner packed up the place and put it in storage. Wasabi moved in with the owner’s other downtown restaurant. And Douglas Theaters closed the StarShip, which it wanted to do anyway. The buildings were demolished, but then nothing happened for a long time. The high-rise project faltered, never happened. The city paved over the empty lots — I call them Seng’s Folly, because Mayor Coleen Seng presided over the fiasco — and started charging people to park there. A recent report by a property watchdog group called the Castle Coalition says this happens all over the nation: Property is bought up — under threat of condemnation — by cities for projects that don’t always materialize. Well, it’s taken three years but finally another project is moving forward on the downtown Lincoln block where they paved paradise to put up a parking lot. 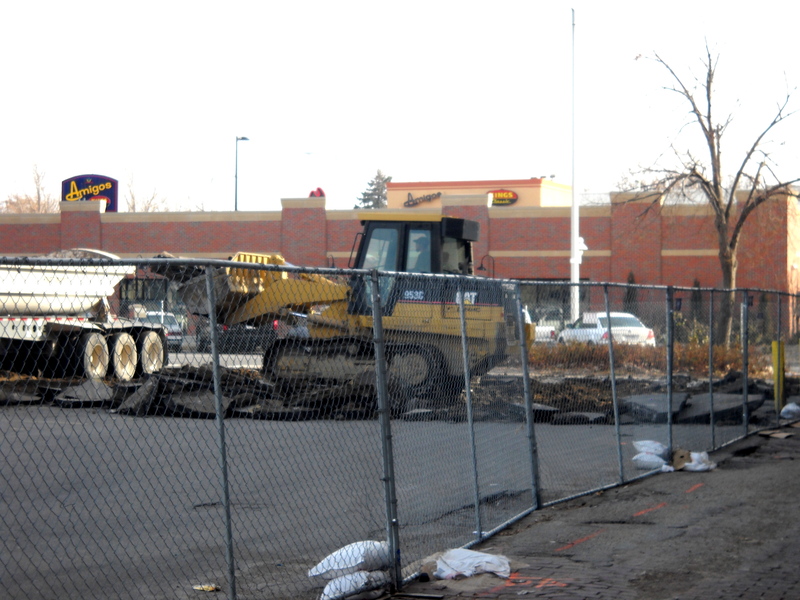 The pavement has been fenced off and they’re tearing it out to make way for a city parking garage topped by private condos that will cater to UNL students. Eminent domain — the taking of private property for public use — was a hot issue around the time the city of Lincoln was angling to get this property, thanks to a Connecticut case that cleared the way for cities to condemn homes in the name of economic development. The U.S. Supreme Court decision prompted a wave of states to enact limits on the way political subdivisions wield their power to “take” property. But not in Nebraska. Oh, they passed a law in 2006. But in its recent 50_State_Report, the Castle Coalition gave Nebraska a D+ on protecting property owners, calling the 2006 legislation a “baby step” with a huge loophole allowing property to be condemned after it’s been designated “blighted.” And of course, the state’s definition of blighted is so broad that even Warren Buffett’s neighborhood was declared blighted by Omaha. In other words, the same thing could happen again in Lincoln. Easily.